The People's Liberation Army Strategic Support Force (PLASSF or SSF ; Chinese: 中国人民解放军战略支援部队) is the cyber-, space-, and electronic-warfare service branch of China's People's Liberation Army. It was established in December 2015 as part of the first wave of the People's Republic of China military reform. Initial announcements did not provide much detail, but Yang Yujun of the Chinese Ministry of Defense described it as a combination of all support forces. Commentators speculate that it will include high-tech operations including space, cyberspace and electronic warfare operations, independent of other branches of the military. Another expert, Yin Zhuo, said that "the major mission of the PLA Strategic Support Force is to give support to the combat operations so that the PLA can gain regional advantages in the space warfare and cyber warfare domains, and to ensure smooth operations." Functionally and structurally, the Strategic Support Force operates like the People's Liberation Army Rocket Force. 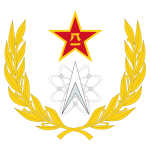 The SSF is formed from the units responsible for space, cyber, and electronic warfare in the former General Staff Department (including the cyber espionage capabilities of the former Third Department, the electronic support measures from the former Fourth Department, and the space-based ISR systems and Aerospace Reconnaissance Bureau and Satellite Main Station), General Political Department, and General Armaments Department (including the launch, telemetry, tracking, and control facilities and research and development organisations). The PLASSF Space Systems Department [zh] is the consolidation of all PLA's space-based C4ISR systems. The PLASSF Network Systems Department [zh] is the integration of all PLA's information warfare capabilities.